Today I planned to post on a classic Puerto Rican Christmas desert, but it occurred to me that I should tell you about one of my all-time favorite Puerto Rican Christmas traditions instead. La parranda. La parranda can be considered the Puerto Rican version of neighborhood Christmas caroling. When I was a little girl, visiting extended family in Puerto Rico, this was always my favorite part of the trip! 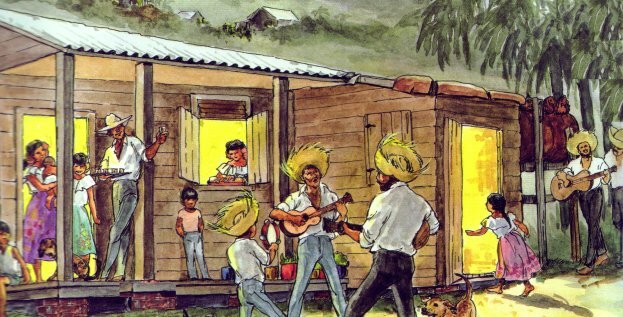 In the parranda, neighbors, and friends gather late at night, usually after 10pm, and visit one house after another singing traditional Puerto Rican songs until dawn the next day. Although there is an element of surprise to the visit, the parranderas like to drop hints to the homeowners to let them know they are coming. Since a parranda can be a pretty large affair it’s good not to startle the homeowners altogether. Also, they want to give the homeowners time to prepare to take good care of their guests! 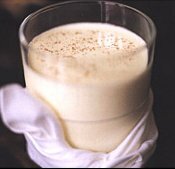 Coquito (Spanish egg nog) is one of the many traditional goodies that a homeowner will serve the parranderas! Although there are many variations, it is usually prepared as follows. Most recipes include rum but I have omitted that! Back to the parranda! The parranderas will stand outside of the front door, and on signal they will all sing and play their musical instruments, some of which include the guitar, the maracas (my favorite), and the tambourine. As you can imagine, the atmosphere is very loud and very festive! The parranderas spend approximately 2 hours at each house. Then the homeowners join them as they move to the next house and the parranda gets bigger. In addition to getting a sense of the sights and sounds of Christmas in Puerto Rico, you can listen to our favorite parranda song below! This is a really wonderful tradition if it is filled with the love and joy about God. Hi Klaus! I feel as if I have not heard from you forever! I hope you are well! I so agree with you! The real joy that this tradition touches upon can truly only be experienced within the community of the saints. Blessings to you my dear brother! I am LOVING your posts about a Puerto Rican Christmas, Christina. What a lovely tradition this is. I’m looking forward to your flan post. It is one of my favorite desserts. There is a Cuban restaurant in Tampa (Ybor City) that we enjoy and I always order the flan. Awww…thank you, Patricia! I must confess that I am having a blast! Last night, when my husband came home, I had some traditional Parranda music playing and I made him dance with me! LOL! It also makes me think of my grandma, who was such an amazing woman of God. She is why I didn’t include the rum in the Coquito recipe! If you wanted rum in your Coquito and grandma was around, you had to bring your own….and you best not let her catch you! Anyway, as always, thank you so much for your love & encouragement! Much love and many blessings to you! Christina, I also did a few of those parranda’s back in the day. My sister in law’s husband was famous for them and people all coming over and making noise and singing and eating to the wee hours of the morning. He also made a mean coquito too. Your video had a very handsome looking pig with a lot of that crunchy skin that family members like to fight over. LOL…….Great job. Elba, I love it that you called that pig “handsome”! Not everyone could appreciate a sight like that! Speaking of which, I am making a pernil for Sunday’s Christmas party at church! If I come to mind, remember to pray! I want to do a good job! Now that I can whip up. Sounds delicious! Blessings! What a fun and rich heriitage you have Christina! I don’t think I could stay awake all night though! Thanks for sharing your joyful memories with us! I don’t think I would have the stamina myself for a parranda either! Come 9pm, I turn into a pumpkin! LOL! Thank you so much for sharing, Christina-your Christmas tradition memories are just lovely! Thank you for sharing them with me Victoria! Love that! brings many wonderful memories! @ Melanie — Lord bless you dear one! It was a pleasure to share our parranda tradition. Thank you for visiting today — on your little one’s birthday and one day before you are about to give birth! I truly pray God’s richest blessings over you, little baby, and the rest of the family! Lord bless you! @ Chicmom — Thank you so much for visiting to share the joy of our parranda tradion! Lord bless you! Thank you for sharing your memories with us all! What a wonderful tradition this is. I am a night owl so this would be right up my ally, LOL! I loved that little slide show with the paloma song takes me back to my childhood. Just last year I spend Christmas with my in laws in P.R. and I saw an unusual parranda it was in vehicles they went down the streets of different towns singing and playing their instruments all with there lights blinking and cars decorated now that took me by surprise because we always did traditional parrandas. I did not know you were P.Rican. That most certainly was an unusual parranda. Are you sure it wasn’t the Puerto Rican Day parade that you saw? LOL! At any rate, yes, I thought you already knew I was PR? Mi mama viene de Santurce. This sounds like so much fun! Can’t wait to try the recipe too!